The small group of men, uneducated by worldly standards, with his blessing and the Holy Spirit guidance, launched a campaign that still reverberates around the globe – “Ye shall be witnesses to me” said the Lord (Acts 1:8) and witnesses they were. The community they established “were of one heart and one soul” (Acts 4:32) such was their unity. How did such divisiveness arise in a body that was initially, so united? With the christianisation of Rome, Hebrew learning and thinking came into abrupt conflict with Greek culture. Though Rome had conquered the world, Greek culture had “conquered Rome” and pervaded the world of learning. Greek thought is diametrically opposed to Hebrew thinking and with the rapid increase of non-Jewish converts, Bible teaching soon became overlaid with Greek philosophy. The particular aspect of Greek philosophy that so affected man’s thinking was termed GREEK METAPHYSICS. “Metaphysics” is that branch of philosophy which treats of the theory of knowledge in general, especially of the most speculative or esoteric nature. This kind of reasoning began with Aristotle, and characterised all Greek learning. But because the Greeks provided such a vast store of literature and established schools, it easily became the educational base for learning in the West. There was simply no other recorded literature that could be used as a base. In this way, Greek philosophy, and the study of the classics for something like 1800 years, actually ensured that a corrupted view of Bible teaching remained popular. The philosophical approach to religion and science reasoned away fundamental Biblical doctrines, and soon affected the Israelitish nature of the Promises of God. A simple reading of early ‘church history’ soon makes this apparent. This belief, so prevalent among the pagans, was introduced to the Greeks by the reasoning of Plato. Plato and his associates felt that their wisdom had advanced so remarkably, that it was incongruous to think that their ‘higher learning’ should one day end in ignominy and death. The Greeks divided the human personality into three distinct parts: body, soul and spirit. The following extract from ‘Decline and Fall of the Roman Empire’ by Gibbon. (Vol 1; pg 448-9) shows this. Gibbon is a widely accepted eighteenth century historian, who gathered together all the records of the ancients in a very readable history. “..There were a few sages of Greece and Rome who had conceived a more exalted idea of human nature, though it must be confessed that in the sublime enquiry, their reason had been often guided by their imagination, and that their imagination had been prompted by their vanity. When they viewed with complacency the extent of their own mental powers, when they exercised the various faculties of memory, of fancy, and of judgment, in the most profound speculations or the most important labours, and when they reflected on the desire of fame, which transported them into future ages, far beyond the bounds of death and of the grave, they were unwilling to confound themselves with the beasts of the field, or to suppose that a being, for whose dignity they entertained the most sincere admiration, could be limited to a spot of earth and to a few years of duration. “With this favourable prepossession they summoned to their aid the science, or rather the language, of Metaphysics. “They soon discovered that, as none of the properties of matter will apply to the operations of the mind, the human soul must consequently be a substance distinct from the body, pure, simple and spiritual, incapable of dissolution and susceptible of a much higher degree of virtue and happiness after the release from its corporeal prison. From these specious and noble principles the philosophers who trod in the footsteps of Plato deduced a very unjustifiable conclusion, since they asserted, not only the future immortality, but the past eternity of the human soul, which they were too apt to consider as a portion of the infinite and self-existing spirit which pervades and sustains the universe. Footnote: The pre-existence of human souls, so far at least as that doctrine is compatible with religion, was adopted by many of the Greek and Latin fathers. See Beausobre, Hist. du Manicheisme, 1 vi. c 4″. “Plato in the Phaedo advances the view that at death the soul, being set free from the body, which is concerned with imperfect and transient things, goes to be at one with eternal goodness, eternal beauty, and the other Platonic “forms”, which are at once perfect and beyond the reach of change, and to which the soul is akin. “The Jews do not perceive of matter as a thing or an object but as an energy that we really ought to listen to. Matter too is part of the divine word of creation. Matter for the Jew is not a thing or an object but a word and deed, an energy. Furthermore, in Hebrew there is no word for ‘body’. Lacking even a word for it, the Hebrews obviously were not involved in controlling the body. In fact, for the Jewish mentality, ‘the body is nothing other than the living soul’. The body is the person and the person is the body…. There is no dualism, that is to say, separation of spirit and matter or spirit and energy in Jewish thinking. For this reason, the sensual is a gift and not a threat to the spiritual person…. We act as the imago Dei, the likeness of the Creator. In contrast, for Greek thought, the body is a cage that entraps and limits and stifles the release to the world of ideas that Plato so sought after. 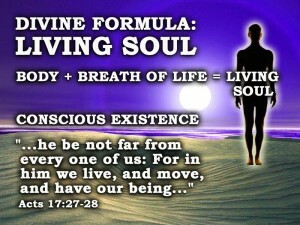 A simple analysis of the word soul (nephesh) throughout the Scripture will show this. Isaiah 53:11 “poured out his (Christ’s) soul unto death” i.e. Even righteous souls die. 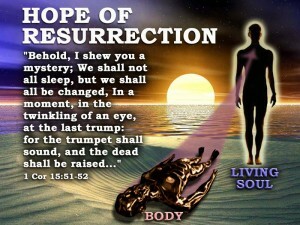 1 Cor 15:20 There is No Hope apart from a resurrection. 1 Corinthians 15:54 Only then, can we say “death is swallowed up of victory”. This second example clearly shows that we do not have immortality now ‑ we have to spend a life following Christ in a probation, before we are given it as a gift at the judgment seat of Christ. Another false doctrine, “The Trinity” has its roots in paganism, its key influence being from Greek mythology. “Trinity” as a word NEVER occurs in the Bible. The Apostle John uses this doctrine to identify the ‘anti-christ’ in 1 John 4:1-3. 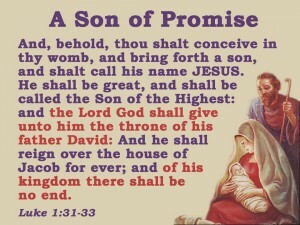 This is a doctrine that denies the humanity of Christ, and makes him the second person of the trinity – God the Son. They are “deceivers” (2 John 7) and “false teachers who privately shall bring in damnable heresies, even denying the Lord that bought them” says Peter (2 Peter 2:1) They deny the Lord when they deny his humanity (compare Hebrews 2:14-18; 5:7-10). In the Greek New Testament, the word “Logos” is widely used to mean simply “word”. A different word, “rhema,” indicates the spoken word. “Logos” indicates the plan or the purpose that God had in mind, when He conceived and later revealed His intention to man. Jesus Christ, is the Word (Logos) made flesh, who perfectly revealed and exhibited the purpose and moral excellence of God. A rift over the teaching of the Logos developed into an argument over the nature of the Lord Jesus Christ. As he was both Son of man and Son of God, the philosophers wrangled just how this could be. The contention was so sharp, that Constantine the Emperor (who had just permitted freedom of religion with the Edict of Milan in AD313) became worried for the unity and security of his empire. As a result, he called a conference or council at Nicea in AD324 and presided over it himself, notwithstanding that he was a layman. It was this council that decided in favour of the Trinity: the teaching of God, Jesus Christ and the Holy Spirit being separate persons, each gods in their own right, yet mysteriously also One person. In time, even churchmen came to acknowledge that the Trinity had no Biblical base but claim “it was a necessary development of church teaching”. Thus the ancient hope of the Scriptures was relegated to the dust heap in favour of a well organised church with political aspirations. 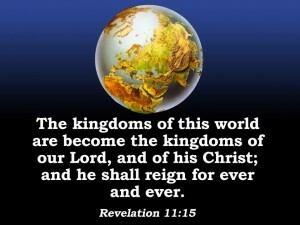 As a result, the church proclaimed itself: the Kingdom of God. In an endeavour to live in holiness, some men and women separated themselves from ordinary life to live alone in extremity and poverty, or later, join monasteries. An asceticism developed, separating man from family life and ordinary contact with his fellows. There is no Biblical justification for this. And so the growth of the power of priesthood and papacy assumed monumental proportions, until all who questioned their authority became quite literally fuel for the fire. It has been conservatively estimated that 56 millions perished over the years at the hands of the church. Over the years, the church developed a system of tradition and various types of services and observances of holy days and feast days. The priestly activity and vestments were unknown in the early congregation. 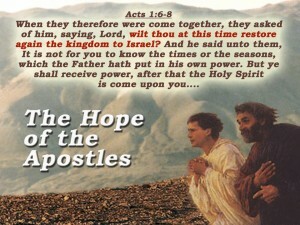 They are all quite without apostolic precedent. With the completion of the observance of the ritual and law of Moses, the Scriptures only support two ceremonies, baptism and breaking of bread. The church hierarchy and tradition has taken away personal knowledge and personal faith ‑ absolutely vital for acceptance with God. “This is life eternal: to know thee, the only true God and Jesus Christ whom thou hast sent” (John 17:3). Fellowship: Describes the sharing of the believers, who are welded together as the body of Christ (Ephesians 4:12‑16). Prayers: Without communication with God, we are not under His guidance, which we need. Where do Christadelphians fit into the picture? 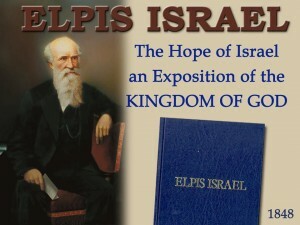 Christadelphians arose during a time of intense Bible interest. Education for ordinary folk was opening up, and the promotion of the distribution of the Bible by the British and Foreign Bible Society from the beginning of the 19th century, increased its ready availability. With the wider distribution of the Scriptures and the work of men like Wesley and Knox, who promoted the concept of PERSONAL FAITH, a great interest arose in public and private discussion of the teaching of the Bible. In the past, this had been largely the province of the learned and the churchmen. In this fervour of searching for Bible truth, the Christadelphians came about, not by plan, but beginning with the searching of one man. Originally Dr. John Thomas (the son of a clergyman) was associated with the Church of Christ (formerly known as Campbellites), but his continual studies led him to question the teaching of the Campbellites, not before however, many of their congregations in both America and Englandhad listened to his exposition of the Scriptures. His classical education, and knowledge in both Greek and Hebrew, helped equip him in his search for Bible truth, and he came to endorse what a number of reformers had found, that the churches were largely astray. At the time of the American Civil War (1861-5) believers, who simply called themselves “brethren of Christ”, found that they were on opposite sides of the fence. Their understanding of the Scriptures had led them to stand apart from politics, and for the same reason, “as strangers and pilgrims on earth” (Hebrews 11:13) they also refused to fight to maintain civil life which they believed that Christ would soon come to dispense with in any case. They sought exemption from serving in the armed forces and the authorities required a name by which they be known. The custom of the day, to call themselves after their mentor, was prevented by protest of John Thomas, who believed that their sight should firmly be fixed upon Christ as head of the body. The name ‘Christadelphian’ simply means ‘brother of Christ’. The present distress upon the earth is simply because men and women have neglected to follow the ‘manufacturer’s instructions’ and they are reaping the consequences. The only remedy is to return to the divine specifications, to open the manufacturer’s handbook and operate according to the instructions therein. But the pride of man will usually not let him do that. No human can be truly fulfilled unless he lives in harmony with creation – both the physical laws of our planet and spiritual code divinely placed to govern our behaviour. God has made men and women “in his image and in his likeness”. 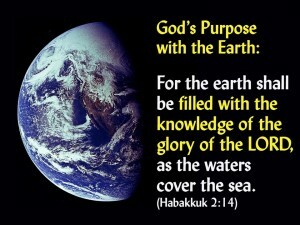 We can never fulfil the purpose of creation, unless we fashion our lives according to Him. Instead, the vast majority allow worldly ambition and fashion to quite literally squeeze them into their mould. Thus the “god of this world hath blinded the minds of them which believe not” (2 Corinthians 4:4).